Emerging from a TDL incubator project, COSTAR was a proposal to the European Commission intended to generate new business for and by SMEs. SMEs are the most critical yet most vulnerable of the ecosystems on the Internet and yet they have insufficient knowledge and resources to protect themselves against advanced malicious Internet activities, even though they might be held responsible and liable, now and in the future. While SMEs represent more than 75% of Europe’s businesses, only a small number of SMEs are using the Internet for critical business purposes – the majority are reluctant to do so being afraid of fraud and economic damage. 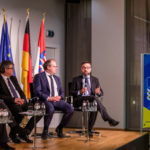 What is needed to help boost the ICT opportunity in Europe is to make the critical economic infrastructure of SMEs less vulnerable to cyber-attacks through the provision of managed cybersecurity services, across each EU Member State. It must go beyond the traditional offerings of Internet and telecom service providers to provide the confidence that SMEs need so that they can benefit from the safe use of the Internet and protection of their businesses.